Two new studies show consumers increasingly own and use mobile devices—in some cases in lieu of other electronic devices—and that means retailers need to be armed and ready with a mobile plan for the all-important holiday sales season. Mobile commerce platform provider and mobile app builder GPShopper commissioned digital measurement firm comScore Inc. to survey mobile shoppers, or smartphone owners who use their mobile phone to shop, on their plans for this year’s holiday shopping season in November and December 2015. ComScore surveyed 1,189 U.S. adult mobile shoppers whose ages mirror the population of U.S. Internet users. 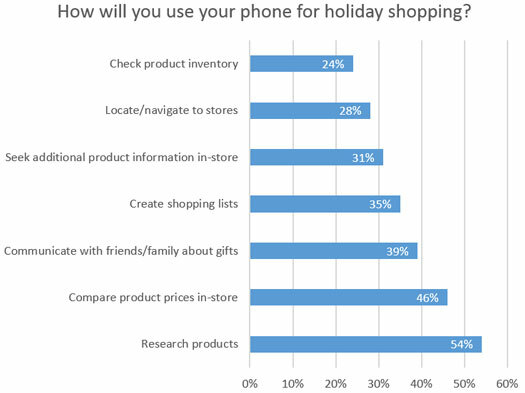 The study finds 83% of mobile shoppers will use their phones for holiday shopping and two-thirds of those mobile shoppers will make purchases via their smartphones. It also finds that this holiday season consumers will rely on mobile apps, with 55% of mobile shoppers planning to use retail apps to track deals and prices. It also find that two-thirds of mobile shoppers have had their favorite retailer apps on their phones for six months or longer. Additionally, 49% of mobile shoppers will rely on mobile apps and mobile web sites during the holidays to provide coupons. 46% will use mobile to look up customer reviews. 37% will consult mobile for their loyalty accounts and 35% will use mobile devices to locate a store. Another new study from Pew Research Center suggests U.S. consumers’ mobile devices are in some cases replacing other electronic devices. 68% of U.S. adults have a smartphone up from 35% in 2011, according to newly released survey data from Pew Research Center. The share of U.S. adults who own a tablet now stands at 45%, up from 4% in 2010. However, the percentage of U.S. adults with desktops and laptops is falling slightly, with 73% of U.S. adults owning a desktop or laptop computer, down from 80% in 2012. Additionally, 40% of adults own an MP3 player, down from 47% in 2010. And, 19% of adults report owning an e-reader, while in early 2014 that percentage was 32%. The trends of falling use of some devices is particularly notable for younger adults. 78% of adults under the age of 30 own a laptop or desktop computer, compared with 88% in that age group that owned one in 2010. Similarly, among those ages 18 to 29, three-quarters owned an MP3 player in 2010, but that has fallen to 51% today. The analysis in the Pew report is based mostly on telephone interviews conducted March 17, 2015 through April 12, 2015 among a national sample of 1,907 U.S. adults, 18 years of age or older, living in all 50 U.S. states and the District of Columbia. Results for smartphone ownership come from a survey of 2,001 U.S. adults conducted between June 10, 2015 and July 12, 2015. Sign up for a free subscription to Mobile Strategies 360, a newsletter reporting on how businesses in all industries use mobile technologies to communicate with and market and sell to their consumers. Mobile Strategies 360 is published by Vertical Web Media LLC, which also publishes Internet Retailer, a business publication on e-retailing.